It really shouldn’t surprise us that fibromyalgia upper back pain is one of the most relentless of symptoms that fibro people experience. Although fibromyalgia affects the entire body, there are some areas of the fibro body that are more vulnerable to perpetuating factors. Chronic upper back pain is one of the major symptoms of fibromyalgia. Upper back pain often radiates to the neck, shoulders, and can even wrap around the entire head affecting our ability to think and interact with the world around us. What starts in the mid back or trapezius area can soon spread to the face and sinus area, leaving a fibro person wondering what in the world just happened. On the “Mind Body Science” page, I referred to what scientists called “nodes” or “hot spots” that lie along the main neural pathways. These are places where various types of nerve fibers, nerve cells, soft tissue, bone, and neurochemical pathways all come together in very close association. Mutation or damage to nerve cells associated with these areas can result in chronic fibromyalgia pain. Fibromyalgia affects the entire body and multiple systems within the body. There are also many tender points and even more trigger points within the fibro body that create a greater vulnerability to perpetuating factors. Certain areas of the body are just more susceptible to everything from stress to activities of daily living. One of these areas is the upper back region located around the neck, shoulders and scapula. The upper back scapula area is often a point of referral where both tender points and trigger points come into play…or maybe we should say.. “come out to play” resulting in fibromyalgia upper back pain. Not that it feels like ‘play time’ to the fibro person, but it definitely does “play havoc” with our musculo-skeletal system and our nervous system as well. When this area is tight, knotted and burning, the entire nervous system is affected. (Just like with chronic migraine.) This area of the body is naturally more prone to stress, over exertion, daily activities and lack of sleep and proper regeneration. When trigger points are active within the fibro body, this can affect many activities of daily living. Reaching up to a high shelf or reaching down to the clothes dryer, dishwasher or to the floor can exacerbate the pain in the scapula, neck and shoulder areas. TRP’s in the scapula and trapezius area can radiate and extend up to the neck, back of the skull and wrap around the entire head and even into the face and sinus area. If you are in a position where someone is asking for your assistance to pick up something heavy, stop and consider if this is a good idea for you. As I often say, it is not just the weight, but the "angle" at which you are lifting that can put extra strain on the upper body. Back and chest pain often go together. It's not unusual for the upper back pain to wrap around to the upper chest area which increases stress level due to concern about the heart. Any heart related conditions should always be assessed separately. It can be helpful to assess your neck alignment by x-ray , and if needed, use a cervical device to help restore the natural curve. Many people spend so much time on devices or computers these days and this is disrupting that natural curve and causing straight neck or even what we call "cell phone neck"
By the way, if you have issues with reaching up to a high shelf, or down to the floor, be sure to see the "grab it" tool at bottom of this page, as this can be very helpful when living with fibromyalgia and myofascial pain. So what starts as fibromyalgia upper back pain and burning can radiate and extend to the entire head causing a greater propensity to debilitation. You may remember me talking in videos on the facebook page about clothing. Yes, even the clothes we wear can affect pain and symptoms in the upper body; examples are collars on shirts or jackets, heavy coats, and scarves that wrap around the neck. Yes, even scarves can create greater pain in the neck area unless they are wrapped loosely around the neck. What might feel like “light” clothing to a non-fibro, can feel heavy and painful to a fibro body. 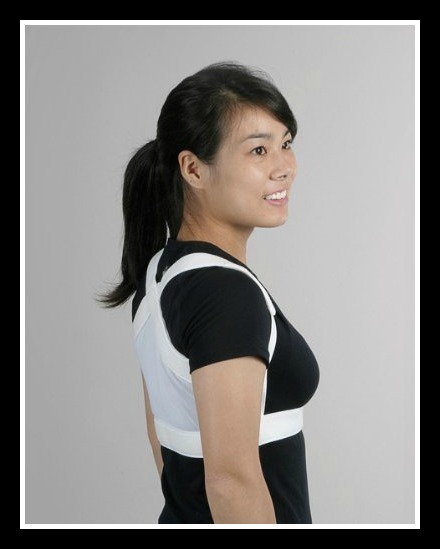 Some clothing can actually affect good posture as well. Be aware of anything that “pulls” on the neck and upper back. As mentioned above, even a slight pulling on the upper neck from a bathing suit strap or tie (around the neck) can activate trigger points in fibromyalgia. You may have latent trigger points that are not hurting you in that moment UNTIL you have something even so slightly "pulling" on your neck. This can be even more troublesome for those of us with fibro because it can seem like the slightest piece of clothing or straps can activate pain that can increase symptoms in that general area and may linger for days. Headaches and trapezius upper back pain are two good examples. Remember, it doesn't take much to activate trigger points, but it takes longer to alleviate them. That is where everything we ascribe to here in the website is essential to avoiding extended flares and increased pain, because even your "stress" about being in a certain situation can activate trigger points. Putting on and taking off shirts, sweaters, bras and anything especially form fitting can be difficult, especially when trigger points are active and/or tender points are particularly tender. Most people with fibro find that what they wear both on the upper AND lower body does make a difference in pain levels. Tight or even just “form fitting” jeans/pants around the tender points in the lower body are another example of clothing that can affect the fibro body. It may be necessary to go up one size just to “accommodate” the more sensitive areas. Be sure that you only wash all of your clothes and your family clothes and linens in non toxic fragrance free detergents. These synthetic fragrances can easily contribute to symptoms. I will link our chemical sensitivity article at the bottom of this article. Follow on the Fibro Fit People fitness page if you like. In the video section there, I have short videos that include gentle yet effective exercises for the upper body. Review each title before viewing. In the Natural Remedies article. Body work section, we talk about a couple of therapies for fibromyalgia that can be very helpful. Both Myotherapy and Bowen therapy. 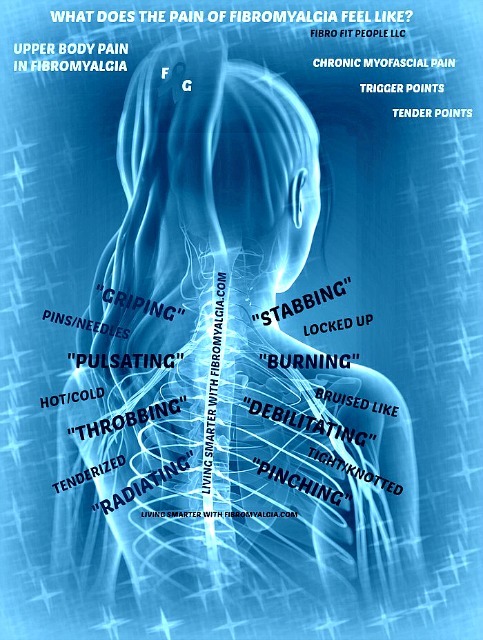 Helping to release these trigger points is essential if you continue to have burning, radiating pain in the upper back. Below is the 'Shoulders Back', a form of light upper body compression we like to use when either stress or pain levels are high. It is actually very soothing, like a soft hug, only better!! A therapeutic soft hug. I use this to also calm the tightness that can occur with stress around the pectoralis muscles, which is very common in fibromyalgia. This device can actually calm those trigger points, unlike clothing, and only needs to be worn about 30 minutes at a time. We did not acquire fibromyalgia due to poor posture, however, because we have fibro, we must be very aware of our posture while standing, and especially while sitting for extended periods of time. Many of the devices we use today can wreak havoc on our upper body. Personal computers, cell phones, tablets, etc. For those with CFS/ME and fibromyalgia, there is sometimes a difficulty in maintaining an upright position. As we often talk about here, the way that a fibro person relaxes may be different than how a non-fibro body relaxes. Therefore, you are not being “lazy” because YOUR way of relaxing may involve lying down instead of sitting. A non-fibro may be perfectly relaxed sitting on a couch, whereas a fibro body cannot always maintain that position without undue strain which exacerbates the fibromyalgia upper back pain. Below is a tool that I find helpful on those "bad" back pain days. 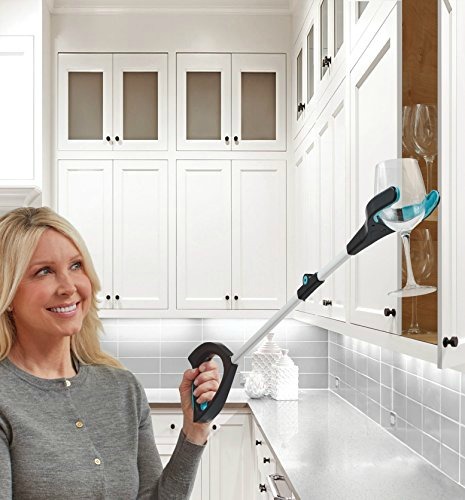 Above, is the Grab It Grabber that I find quite useful, particularly picking up items from the floor; others might use it for items on the top shelf of your cabinets or pantry. Visit our fitness page on Facebook by using this link. As a practitioner and fitness trainer specializing in fibromyalgia and fibro specific exercise, this is what I do. As a fellow fibro person for over four decades, I certainly "get it" Lisa. FG.